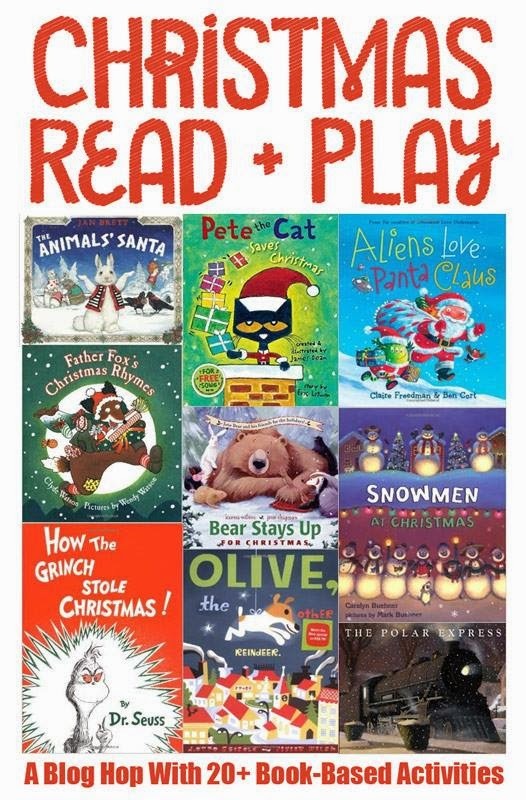 We're really excited to participate in the Christmas Read + Play blog hop. We participated in the Halloween Read + Play collection in October with our Halloween Sticky Collage and loved all the great ideas we gained then. For this series, over 20 bloggers have chosen a favorite holiday book and paired it with a fun play, craft, or learning activity. There are several great books and ideas to get you through the whole season! We love seeing what great, new ideas we can gain from all these other fabulous bloggers. Several years ago I fell in love with the Christmas story The Night Tree by Eve Bunting. It tells the story of a family who has a special Christmas tradition: every year they head into the woods to decorate a tree with popcorn, fruit, and seed balls. 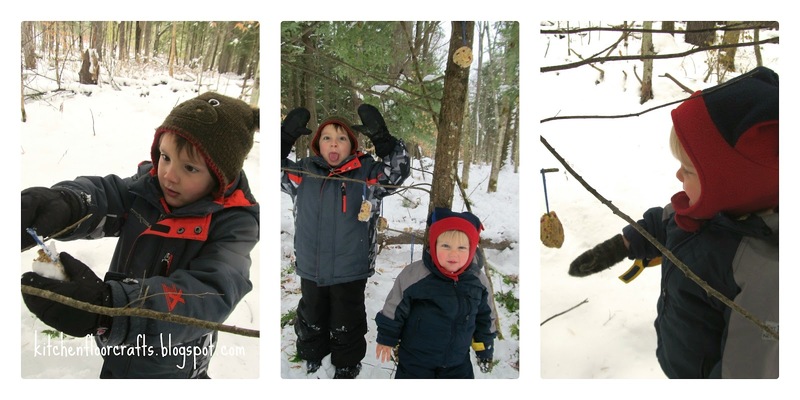 This tradition not only provides them with the opportunity to be together as a family but also to practice the spirit of giving by leaving treats for the animals of the forest. 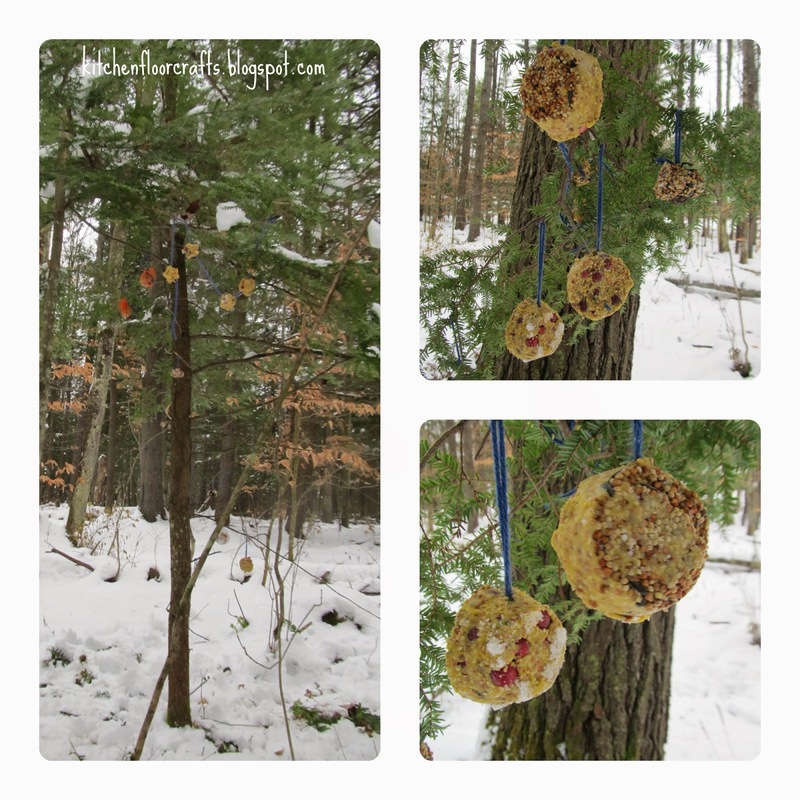 We were inspired by the book to create our own homemade bird feeder ornaments so we could decorate a tree for the wildlife in the woods behind our home. 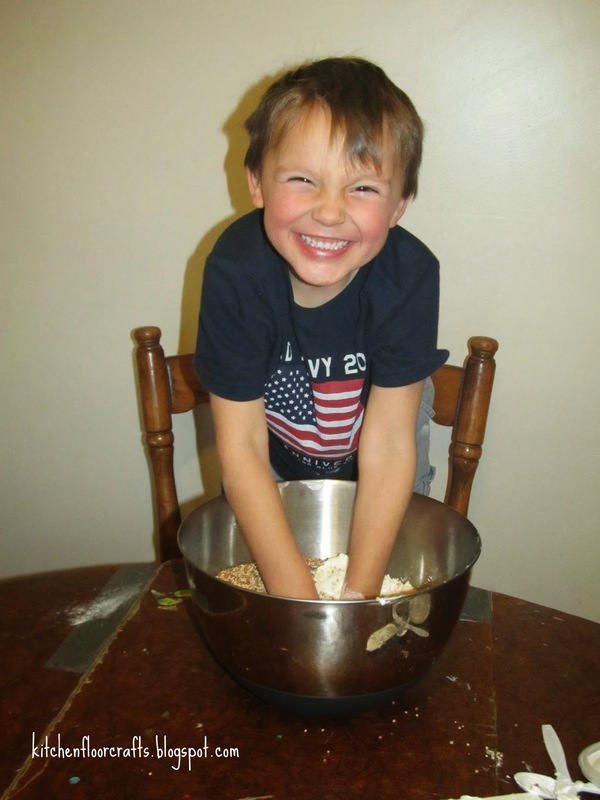 We found some great recipe ideas first off at the national Audubon Society page for homemade bird feeders. 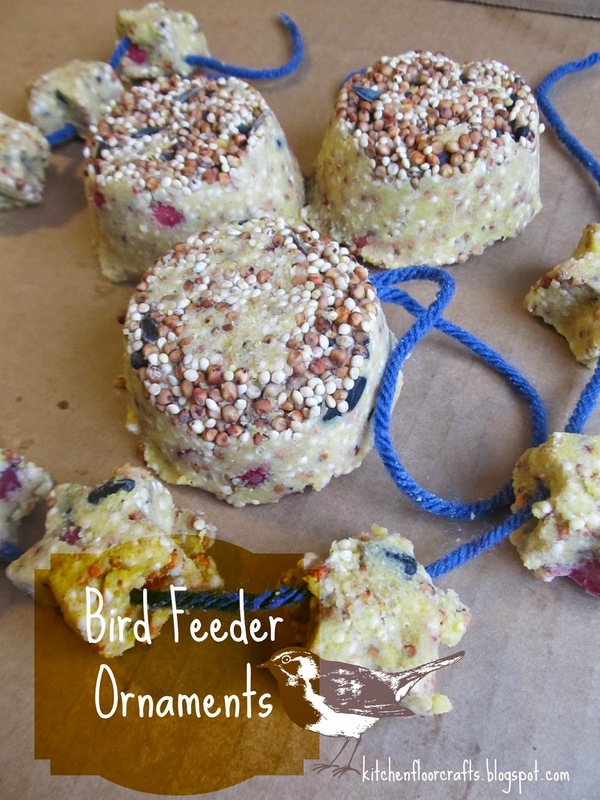 We decided to tweak the suet recipe listed there just a little bit. We used silicone baking and ice cube trays, some pinecones, netting from a clementine bag, and yarn to create a few different ornament styles. Quick Note: This did turn into one of the messier projects we'd done in a while, but the results were pretty and fun, and luckily we own a vacuum for clean up. 3. We used some of the extra goop to make small balls which we wrapped in the orange netting and tied with more yarn. 4. We placed the trays in the freezer to set overnight and then kept them in the fridge until we were ready to hang them outside. While Big Brother and I were working on the seed ornaments in the trays, I set up a different seed activity for Little Brother. 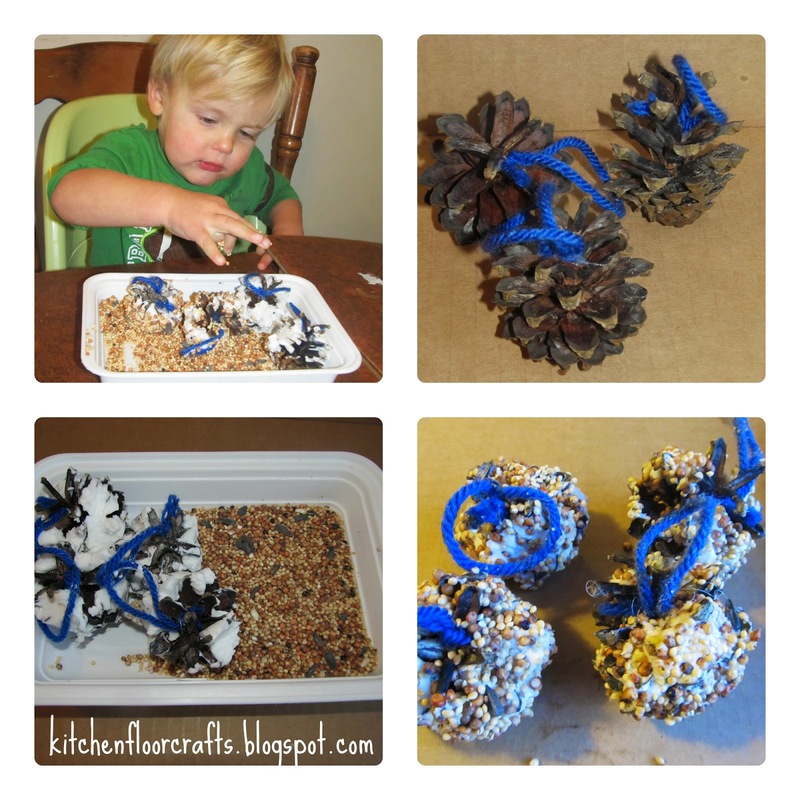 I hot glued small yarns loops to pinecones and smeared the Crisco around the edges of each one. I gave him a small tray of bird seed and he rolled the pinecones in the seed and sprinkled the seeds on top. After our ornaments had chilled overnight we got ready to go for our walk and decorate our tree. First we popped the ornaments out of the trays. The silicone trays definitely worked best for this. A few of the stars came off the garland as we removed them, but we kept them regardless. The boys had fun hanging the decorations. 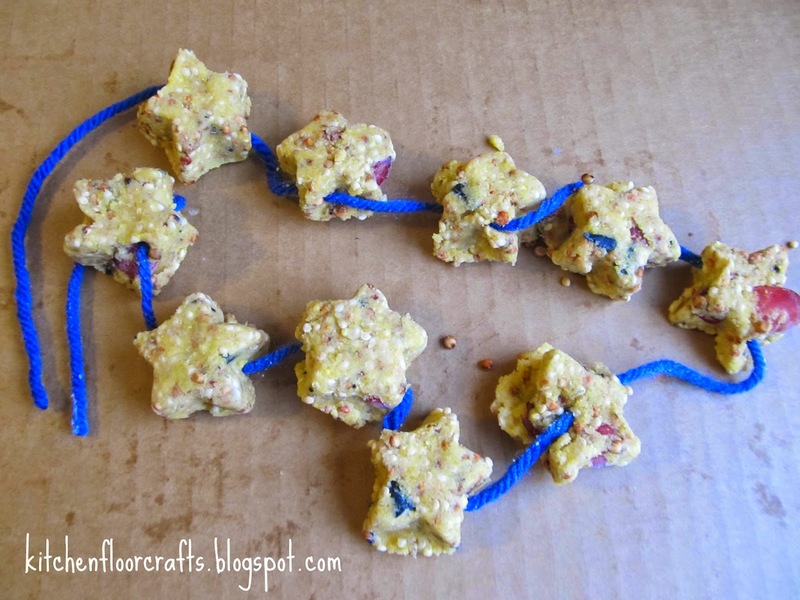 Big Brother helped get a little creative with what to do with the handful of stars which had fallen off their garland by sticking them on the ends of the branches. Our tree looked very festive by the end! We're looking forward to doing this again later this month and decorating the tree a second time a little closer to Christmas. 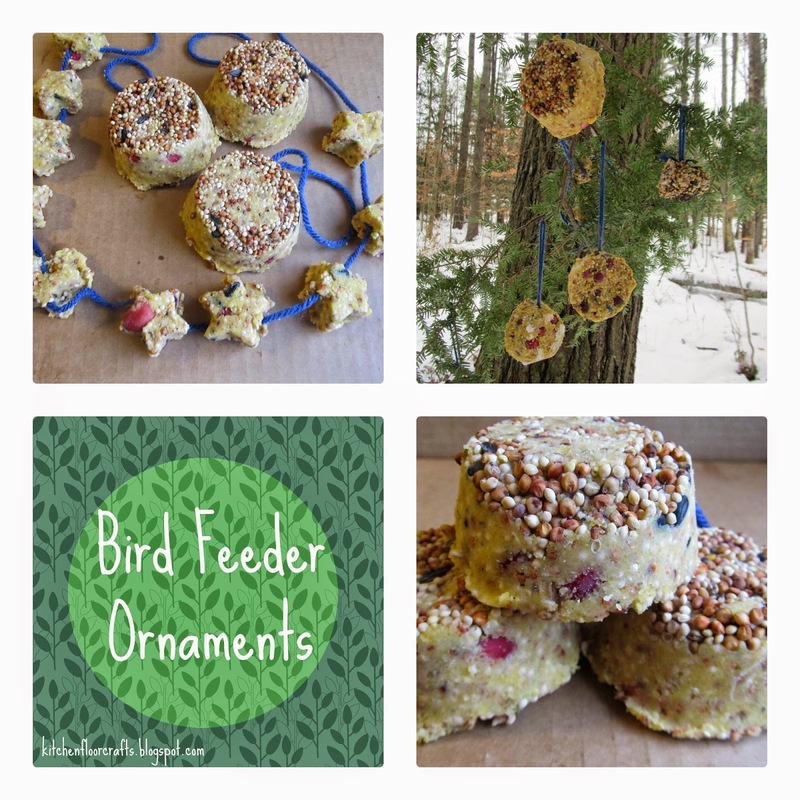 Other ideas for decorations include popcorn chains, dried fruit rings, orange peel feeders, and bagels spread with peanut butter and seeds. Be sure to stop by some other blogs and check out their awesome ideas to go along with favorite Christmas books! 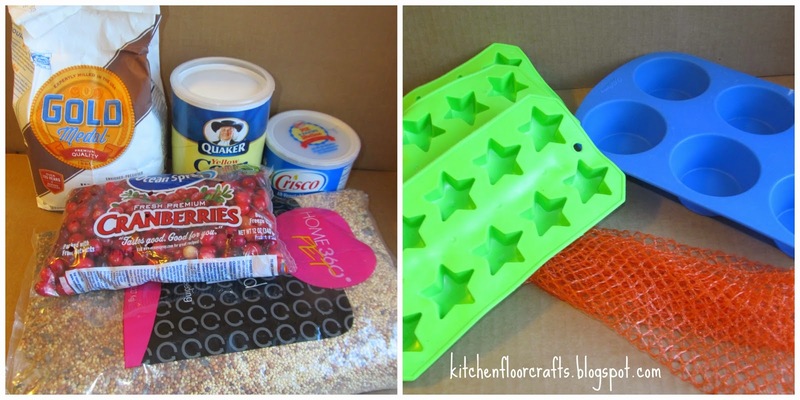 Thanks to Carolyn at The Pleasantest Thing for organizing this great Blog Hop! What lucky birds you have in your neighborhood, when they come across this tree full of yumminess! Thanks Emma! I'm hoping we can go back in a few more days and see if the treats have been sampled yet. Us too now. 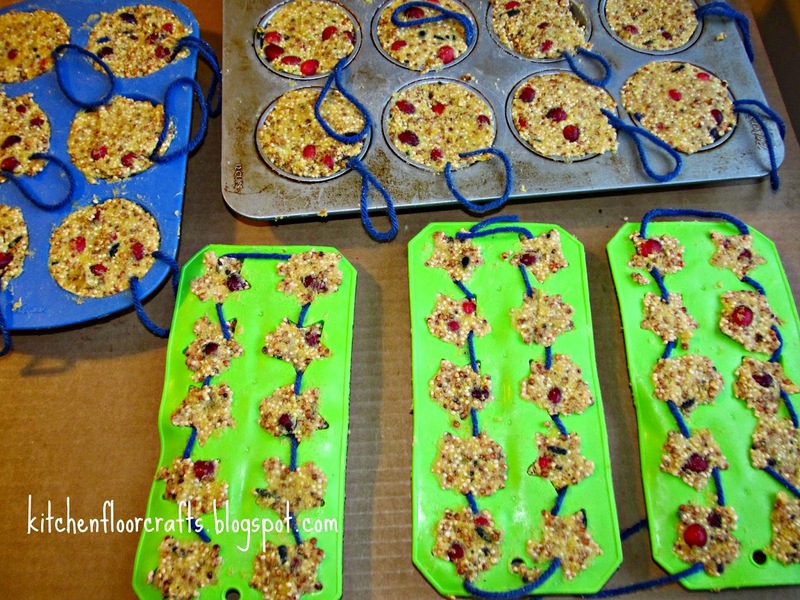 I've already started thinking about some other cute, hands on ideas too as the kids liked it. What a cool idea! Thanks for sharing. Thank you. Perfect timing. 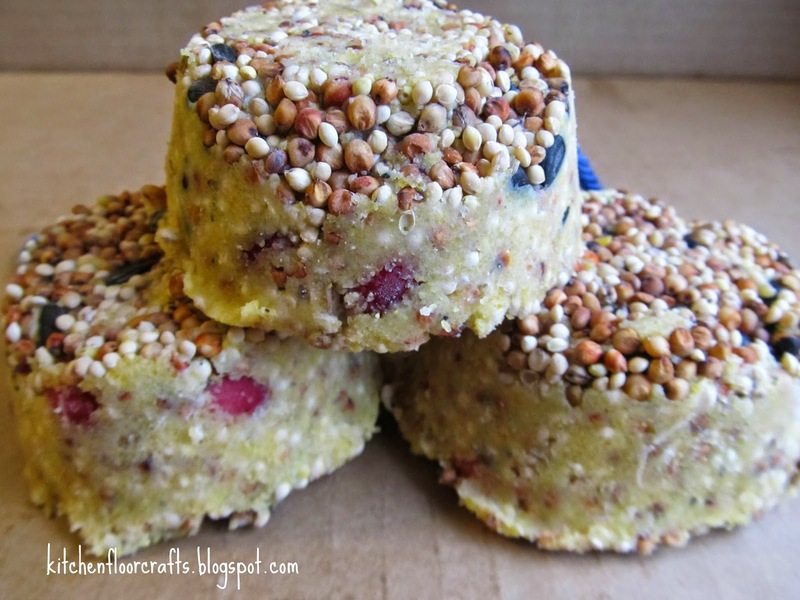 I was just wanting a recipe for making bird feeders without peanut butter. And a good book to go with it is icing on the cake.